The barman reaches down for the bottle, appearing to look over his shoulder. 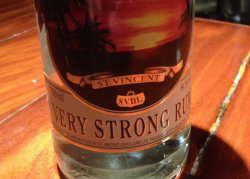 This rum is only available for those who ask, he says. Why? And when you taste it, you’ll soon think that the Grenadine Air Alliance runs exclusively on the stuff. As for the taste? Well, for the uninitiated, it may indeed taste like jet fuel. Click here to read the complete article at Caribbean Journal – incuding the recipe for the Caribbean’s strongest Rum Punch. Don’t Miss RumBahamas – A Festival of Rum, Food & Culture in Nassau, Bahamas, February 22 & 23, 2014.